This is a nice looking set of cutlery with a leaf motif on the handles. It’s called Blossom Sand and is made by Cambridge Silversmiths. But don’t be confused by the manufacture’s name, it’s made of brushed finish stainless steel and not silver. Be wary that not all silverware is silver. 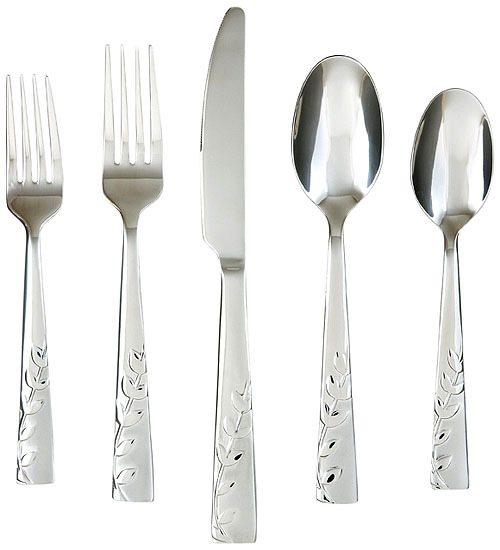 That aside this flatware set consists of 4 salad forks, 4 dinner forks, 4 teaspoons, 4 tablespoons, and 4 butter knives. It is dishwasher safe with a 25-year limited warranty. ← This is not Silverware by Tim Burton. It’s by Isaïe Bloch.